Woodfords Corner has had its first taste of winter and while the Friends of Woodfords Corner Transportation and Mobility Committee is working to improve the delivery of municipal snow removal services, it’s important to remember that Portland’s municipal code puts the burden of clearing sidewalks almost entirely on property owners. From the time “snow has ceased to fall” residential landowners must clear their sidewalk within 24 hours, commercial landowners must clear their sidewalk within 12 hours. All sidewalks must be cleared to at least 4 feet wide, or the width of the sidewalk if less than 4 feet. Property owners who do not clear their sidewalks within the specified time may be billed by the city for removal of the snow and face fines as well. While the ordinance does not require it, we encourage neighbors to try and clear snow from the sidewalk two feet beyond their property lines to ensure clear passage for everyone but especially those with mobility difficulties. We also urge you to make sure there is clear access to the street at corners and crosswalks. 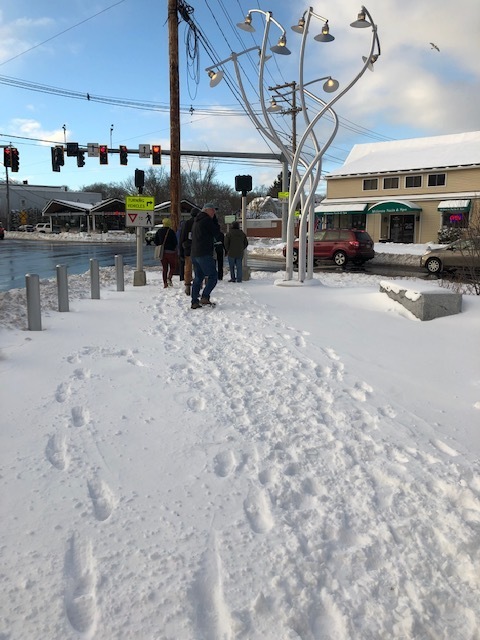 If you have a contractor plowing your driveway or parking area it’s important to make sure that they do not leave mounds of snow blocking sidewalk passages, especially at crosswalks. If you see a sidewalk that has not been cleared of snow please report it on ClickFix. You can report through Portland’s Clickfix website, or download the mobile app, which is available for both iPhones and and Android devices. Let’s all work together to make sure that Woodfords Corner is worth the walk even in winter. The city of Portland provides free sand and salt mix in Payson park at the end of the parking lot on the North side between the two baseball diamonds.